Greater brains than mine have been scratched to come up with a reason why Riesling is so hard to sell to people. There’s no question in my mind that Riesling makes Australia’s best wines, year in and year out. 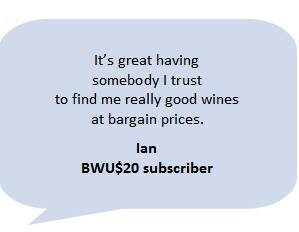 The quality of so many wines in the $15 to $20 range is breathtaking, and the Aussie style of Riesling we’ve evolved is distinctive from Tassie to the Great Southern. Why am I beating this drum again? Because I went to the Riesling tasting put on by GTW (Gourmet Traveller Wine) at Mojo in Waterloo last night, and there was hardly anybody there. 20 people tops, when these events hosted by Peter Bourne – fourth from the right – usually attract 100. This was a more instructive tasting than usual because the wines were presented in pairs, one bottle of the current release and a second of an older vintage – between 5 and 15 years of age. It was fascinating to compare the two and see how they had matured. The wines from Tassie impressed me with their richness, and those from the Great Southern in Western Australia surprised me with their staying power. Read the Rest on the Riesling Blog. The Rieslings we make down under are cool, crisp and refreshing, perfect for our warm weather, great with the cold chicken and ham of our summer picnics or the spicy fare of the diverse Asian restaurants across the country. Riesling makes the perfect lunchtime wine or bistro wine, and a much more refined drink for women than Kiwi Savvy. You can drink young, steely Rieslings with seafood, and older, richer styles with pork dishes as they do in Alsace. They’ll even stand up to a bacon sandwich. Riesling serves up a lot of flavour in an elegant package with 11.5 to 12.5% alcohol, and much less in examples from Germany’s Rheingau or Mosel. The variety is always recognisable, from the delicate Rieslings of the high Eden above the Barossa Valley to the richer wines of Clare. Is there a more versatile wine than Riesling? If there is, I don’t know it. Is there a wine style that offers better value? If there is, I don’t know it. So why is this cool, stylish, versatile and affordable wine so hard to sell to people? I’m not convinced by her claim that Riesling has too much flavour and too strong a personality. Maybe when it’s 10 years old but not when it’s young. Remember, more than 9 out of 10 bottles of wine made down under are consumed in the year they’re made, and young Riesling down under tends to be shy and withdrawn. Sweetness isn’t an issue either for us – when is the last time you had an off-dry Aussie Riesling? 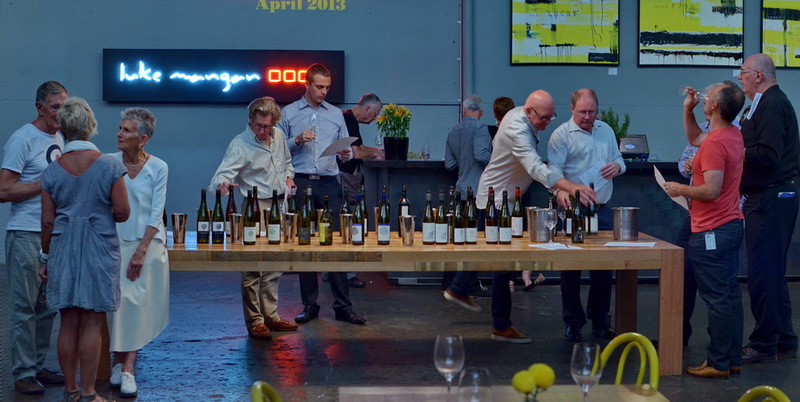 Let me ask you a question: How much publicity did you see leading up to these two events, the biggest Riesling events in the Aussie east coast calendar? A couple of obscure web sites announced the events, that’s about it. Did any blogger write about it afterwards? Not that I know of, in fact the 2015 event received much more publicity than this year’s. The whole show is going the wrong way, it looks like the organisers have given up the unequal struggle. Roast chicken and Riesling are made for each other, and how many people eat roast chicken? Loads, and often. Many grab it on the way home, already cooked. We have to make them grab a bottle of Riesling to go with it, and that comes back to marketing. The unique selling points. It’s a matter of clear, consistent messaging, and taking the product to consumers in their own environments, in shopping centres and railway stations, at street fairs and markets. 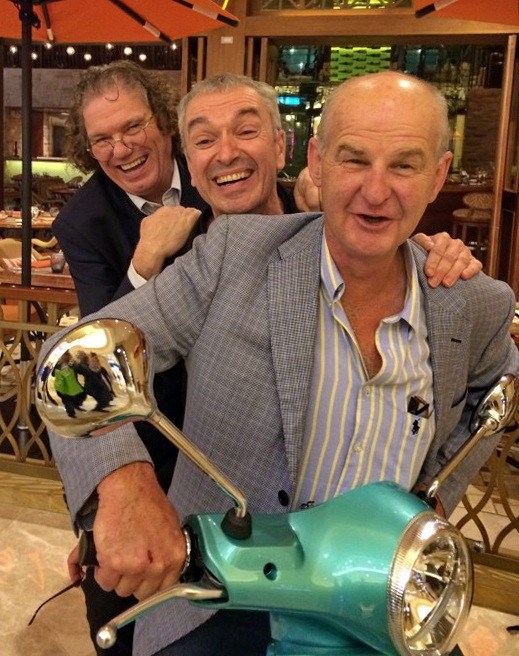 The picture below shows Ernie Loosen, Etienne Hugel and Peter Barry promoting Riesling in Macau – read about it HERE.